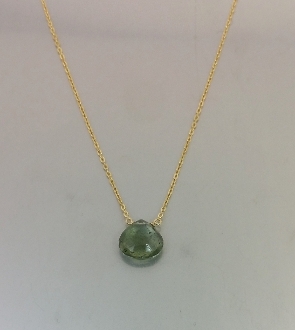 This green moss aquamarine necklace is hand wrapped with 14 karat gold filled wires, and comes on a 16-18 inch 14 karat gold filled chain. Approximate size of stone is 8-9mm. All green moss aquamarine has natural inclusions that might look like small specks on the stone. These are not cracks or defects. **Due to the nature of the stone, color, and sizes will vary.